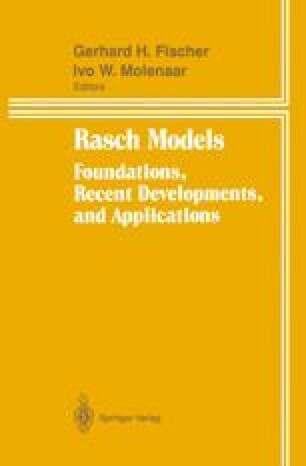 The One Parameter Logistic Model (OPLM) is an item response model that combines the tractable mathematical properties of the Rasch model with the flexibility of the two-parameter logistic model. In the OPLM, difficulty parameters are estimated and discrimination indices imputed as known constants. Imposing a very mild restriction on these indices makes it possible to apply CML to this model. Moreover, the model is an exponential family which makes it possible to construct easily a large class of statistical goodness-of-fit tests by means of the methods discussed in Chapter 5. In particular, since the discrimination indices are not estimated, but imputed by hypothesis, it is important to test the adequacy of their values. Two i tem-oriented tests which are especially powerful against misspecification of the discrimination indices are discussed in detail. An example is added.